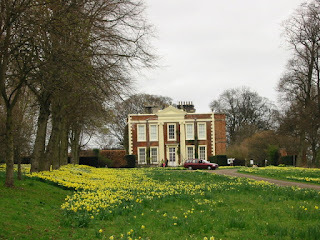 A little to the north of Bournmoor and to the west of Shiney Row, lie the beautiful, tranquil grounds of Biddick Hall. The residence – now a privately-owned venue for functions – dates primarily from the eighteenth century and has been associated with the famous Lambton family since they purchased to estate at the tail-end of the 1500s. The equally well-known Bowes family originally owned the land and the first manor house, but the site was remodelled by the Lambtons in the early 1700s – in a style described as ‘Queen Anne Baroque’. The somewhat eccentric and oversized Ionic pilasters of the entrance dominate the structure – it has been suggested that the design may have been based on a sketch by Sir John Vanbrugh who worked at Lumley Castle in 1721. About a century later, in c.1837, the Lambtons moved out and into their brand new Lambton Castle to the south-west. ‘Lesser’ family members (and occasionally tenants) then took over at Biddick Hall, though it continued to be added to, structurally, until well into the twentieth century. With the decline of their ‘castle’, the top-rank Lambtons moved back to Biddick in 1932 after some further remodelling. As per the recently revamped Lambton Castle, Biddick Hall was used in 2012 by the BBC in the production of the period drama The Paradise. Mr Joseph Murray, of Newcastle, as the representative of the Murray family, who have provided the ball for sixty-five years, duly appeared at one o’clock with the ball in his hand. Immediately he threw out the ball the fun became fast and furious, and, contrary to all the traditions of the game, the ball went rapidly up the street, all the efforts of the Down-Streeters failing to stay the attack of the Up-Streeters, who seemed bent upon making a strong bid for victory. Right away the ball went upwards, only to be checked opposite the Lambton Arms, and again at the King’s Head; then it did not stop until reaching Red Rose Hall. There a change took place; the Down-Streeters made a big effort, and, by the aid of vigorous play on the part of a few fresh hands, conspicuous among whom was a well-known “county back”, the ball was brought rapidly down street, and its progress was not checked until it was shot into the half-frozen river Cone. Plunging in, through the ice and rushing waters, several adventurous players succeeded in getting the ball once more into play, at the expense of a thorough wetting. In a few minutes’ time the ball was again forced into the river, and this time several youngsters got it upon the ice and tried to play it there, only to drop through the ice at very soft places and to lose the ball through the holes into the water, all of which caused immense amusement to the spectators. The ball again went up the street after a terrific struggle, and there it remained, in spite of the Herculean efforts put forth by the Down-Streeters. A few minutes before six o’clock the ball was returned to Mr.Murray, who addressed the multitude from the window of the Crown Inn, congratulating them upon the magnificent struggle there had been. An announcement was subsequently made that next year a cup would be given to be held by some responsible person on behalf of the winners. In 1042, Durham needed a new bishop. By whatever means (thanks, supposedly, to the influence of the mighty Earl Godwin), a monk from Peterborough by the name of Egelric landed the job. So up he came to the North-East and began what he must have considered something of a plum job. Durham had by that time been the home of the mortal remains of St Cuthbert for around half a century. The saint’s previous ‘home’ had been Chester-le-Street, where he had lain during 883-995AD. Since his removal, the little town had lost a good deal of it’s glamour, but Egelric decided to give it a bit of a facelift with the construction of a brand new stone church to replace the battered old wooden affair that had housed Cuthbert’s bits and pieces. Now this is all supposed to have happened towards the end of the bishop’s reign, around 1054-56. The story goes that during excavational work for the new edifice a hoard of gold was found, the workmen having stumbled upon the treasury of the old Roman garrison. Reports vary slightly as to what exactly happened next, but it would appear that Bishop Egelric exercised what you might call his ‘executive right’ and appropriated the gold for himself and did a runner back to Peterborough. More kindly reports have him ‘retiring’ the bishopric of Durham in 1056 and assuming some prominent post at Peterborough, where, suitably endowed with a mysterious fortune, he set about rebuilding many of the roads and pathways of the Fens. The new church at Chester-le-Street was built, however, though presumably the money had already been put aside for this task. According to Arthur Mee’s Durham (1953), the dubious cleric ended up being thrown in the Tower of London for his misdeeds several years later by William the Conqueror.